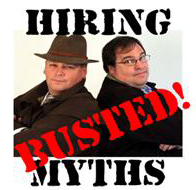 Myth #1: I can only afford to hire people who have experience (usually at least 3-5 years') in this country/industry/job. The sad truth is that in the vast majority of cases, organisations find themselves hiring for experience and firing for fit. We bring people in to the company because they have the right blend of education, credentials, and work experience… and then we let them go because they can’t get along well with their manager, their coworkers or your customers. Far better to find people who fit. Candidates who can work productively with your people and your customers, and who have the ability to learn what they need to know quickly. Hire for fit first, then teach them what they need to learn. That’s the Fit First Philosophy… it will power your business to better results and a stronger P&L.